The Grandmother had been staring steadily over my right shoulder at my Future for several weeks. Pinned in place on the acupuncture table, listening to the familiar rambling tracks of flute music, knowing that she might show me my own Ending, I had at last the courage to ask, Grandmother, what do you see? 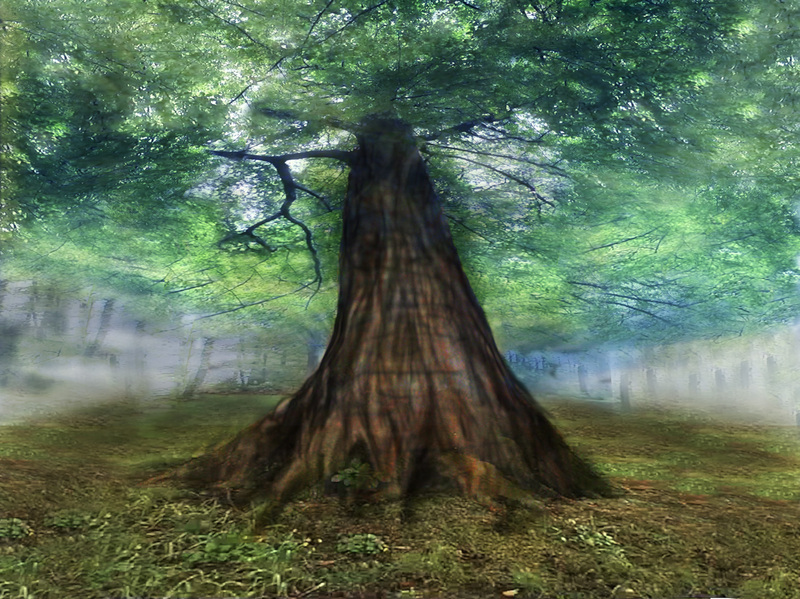 A mighty tree arose in my mind’s eye – a huge, huge tree. Yggdrasil, the Tree of Life! My throat filled. A ragged breath of relief inflated my chest. Tears leaked down my chemotherapy parched cheeks. The tree was rooted, I could see, deep into the lava center of the planet.Earth-energy coursed through the trunk and into the branches that reached far into the heavens. Although I was standing at enough of a distance to see the enormity of the entire tree, my vision was surrealistically detailed. I could see the tree was covered, filled with the countless animals and life forms of Earth. The creatures were climbing, lolling and gamboling on the trunk and every branch and leaf of the great tree.When I looked closely, my vision was so acute that I could see even the legs and tentacles of the insects. I then noticed that at the base of the tree, enormous root ridges ran like rivers across the ground. Then I saw that all the people of the Earth teaming amongst them, building cities and fires and doing their daily tasks, thinking they were living amongst mountain ranges and plains. Almost like a wrinkle, an anomaly interrupted the pattern of the bark. I stared at the trunk of the great tree, Double checking. Sure enough, there was a small rounded door; ajar. Inviting exploration. The Grandmother grinned widely, her face almost split in two, showing her great strong teeth. It was the first time she’d ever directed an expression of emotion toward me personally. This entry was posted in Uncategorized and tagged Aboriginal, Acupuncture, Breast cancer, Cancer, Chemotherapy, Grandmother, Healing, Internal Healer, Living, Tree of Life, Yggdrasil by TruthTeller. Bookmark the permalink.